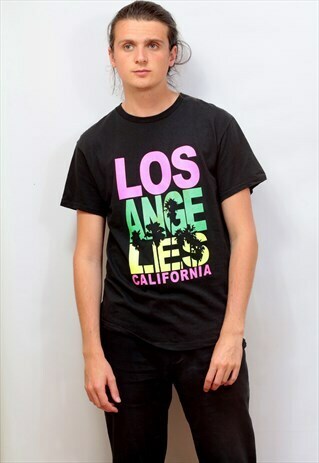 Vintage Los Angeles California print t-shirt in excellent vintage condition. In black. A bright Graphic print on the front of the t-shirt. The t-shirt is a UK size Medium. Our model Harry is 6 foot 2 and wears a UK size Large. All items are shipped with tracking, so you can keep an eye on where your order is at all times! Any questions please feel free to ask. Like our stuff? Click the heart-shaped button to follow our boutique on Marketplace to be the first to see our latest updates. Also please check out/follow us on Instagram for deals and to see items before they get listed on Marketplace.